Most of the foreign citizens resident in our country still have very close ties to their native countries and wish to find their last place of rest there. We have become increasingly aware of this in recent years and have specialised in transferring the deceased to their home countries, whether this be by hearse or by plane. In the meantime, many church and cultural institutions caring for foreign citizens in the Federal Republic of Germany have come to know us as competent and reliable partners in cases of bereavement. We are active throughout the whole of the area of the Federal Republic and carry out all of the formalities both at home and abroad. We supply the coffin and metal inner coffin in accordance with international regulations for the transfer of the deceased. 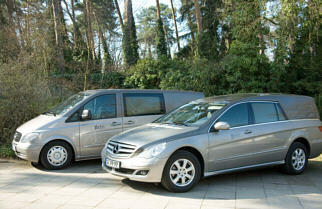 We have the necessary qualified staff and modern transfer vehicles at our disposal. As a result of our proximity to Frankfurt Airport and our co-operation with an air-freight forwarding agent we also have expert knowledge of transport by air. We can transfer in your name and at your order using neutral hearses to all countries within Europe – and, by air, to all parts of the world. Please ask about our favourable terms and conditions. Reliability and assistance together with advice and help in the case of bereavement are the uppermost maxims of our institute. In the case of bereavement, you can place your confidence in our Funeral Home.